The Bill Collins Scholar is named after a distinguished educational leader, who was the first Director of the John C. Stennis Institute of Government at Mississippi State University. 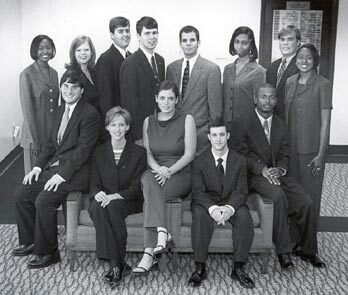 Antoinette Jenkins, standing second from the right, is our most recent Collins Scholar. She is from Hernando, Miss., where both of her parents are educators. Antoinette is a sophomore at MSU, and has been a Dean's Scholar. She is a resident assistant in Cresswell Hall, is the head liaison for the Residence Hall Association, and is also a peer ambassador in the Holmes Cultural Diversity Center. An alumnus of the Day One Leadership program at MSU, Antoinette serves on the Day One Board. She is also historian and membership chair of the Black Student Alliance. A member of the Pre-Law Society, Antoinette is double majoring in political science and education, and plans to teach and attend law school. 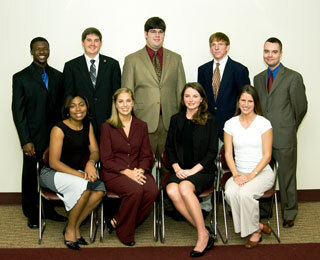 Erien Watson, our most recent Collins Scholar alumnus, is second from the left in the middle row. Erien is the daughter of two teachers, and is from Meridian, Miss. At MSU, she was actively involved in the Black Student Alliance, was in the Catholic Student Association, and served as the external vice president in Delta Xi Phi Multicultural Sorority Inc. Erien worked extensively with a boys and girls club, local animal shelter, and Emerson Family Center to help better her community as a whole. Brian Pugh, in the photo to the right, is one of our most recent Collins Scholar alumni. He is from Gulfport and is a graduate of Harrison Central High School. Brian graduated from Mississippi State University with honors in the spring of 2007, receiving a degree in political science with a minor in philosophy. As an undergraduate, Brian was honored by being inducted into Phi Kappa Phi, was a Dean's and President's Scholar, and received the Minority Achievement award every year. He served as president of the Pre-Law Society, vice-chair of the Political Science Scholars, and vice president of The Gamma Beta Phi Society (National Honors Society). Brian was also a member of the Stennis Montgomery Association and Pi Sigma Alpha. Our department honored him at graduation with the Outstanding Undergraduate Student Award. Brian then worked at the Stennis Institute of Government as a Graduate Research Assistant, compiling research on and assisting with the economic development of distressed counties. In addition, Brian served as an adviser to the Stennis Montgomery Association, as president of Pi Sigma Alpha, and as vice president of The Gamma Beta Phi Society. He earned his master's in public policy and administration from MSU and is currently a budget analyst for the Mississippi Legislative Budget Office. 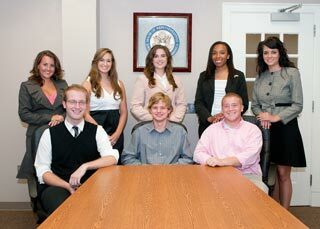 Our previous Collins Scholar was Tameika Cooper, who is on the far left in the front row in the photo to the right. She was a member of College Democrats, NAACP, and Black Student Alliance, and was honored by being inducted into Phi Kappa Phi. A well-rounded individual, Tameika was a member of MSU's Concert Choir, Women's Chorale, and Black Voices. She served as a mentor for three community organizations, a member of the Mississippi Political Science Association, and served as vice president for the National Pan-Hellenic Council. Tameika's career interests are an extension of her public service work with children over her years at MSU, as she would like to start an after-school literacy program for children. 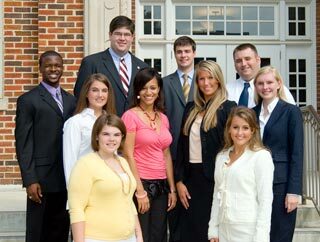 Our previous Collins Scholar was Reteeshia Brown, who is third from the right in the back row in the photo to the right. 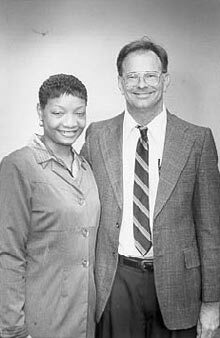 The daughter of Mr. and Mrs. Howard Brown of Greenwood, Miss., she was the valedictorian at Amanda Elzy High School. Her career plans are to become a lawyer. 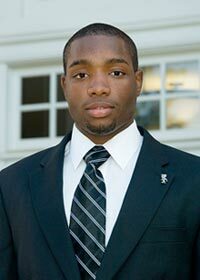 The previous Collins Scholar alumnus was Ta'Shia Shannon, who graduated from the University of Mississippi Law School and is today an attorney in The Edward A. Williamson Law Firm in Philadelphia, Miss. Ta'Shia served as the high school liaison for the Model UN, was a member of the Stennis Montgomery Association, and is in Alpha Kappa Alpha Sorority. She attended a Philadelphia conference on the Truman Scholarship, a Center for the Study of the Presidency conference in Washington, served on the SA Election Commission, and was active in the University Honors Program. Ta'Shia has also served as research assistant on an important study of welfare reform in Mississippi funded by the Rockefeller Institute of Government. She was a President's Scholar, and won the college's Minority Achievement Award. Ta'Shia was honored in her senior year for her outstanding academic record by being inducted into the most exclusive honorary on campus, the Society of Scholars in the Arts and Sciences. To learn about the Bill Collins Speakership series, click here.